Use your Amazon account, could be better price! “Imagine a fully integrated ACM system layered into the value stream of an enterprise. The customer support team is able to focus on customer needs, with easy access to the entire company’s repertoire of knowledge, similar cases, information, and expertise, as if it were a service. To truly accommodate customers, companies must vest real power and authority in the people and systems that interact directly with customers, at the edge of the organization and beyond. ACM augments business processes to deliver true data-driven process infrastructure entering enterprises into the age of intelligent machines and intelligent processes. ACM empowers the knowledge worker to collaborate, derive new insights, and fine tune the way of doing business by placing customers right in the center where they belong, to drive innovation and organizational efficiencies across the global enterprise. “ACM also helps organizations focus on improving or optimizing the line of interaction where our people and systems come into direct contact with customers. It’s a whole different thing; a new way of doing business that enables organizations to literally become one living-breathing entity via collaboration and adaptive data-driven biological-like operating systems. ACM is not just another acronym or business fad. ACM is the process, strategy, framework, and set of tools that enables this evolution and maturity. 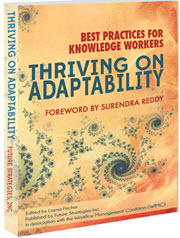 Thriving on Adaptability describes the work of managers, decision makers, executives, doctors, lawyers, campaign managers, emergency responders, strategists, and many others who have to think for a living. These are people who figure out what needs to be done, at the same time that they do it. 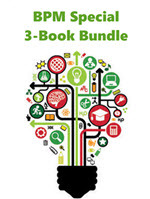 This important book follows the ground-breaking best-sellers, Empowering Knowledge Workers, Taming the Unpredictable, How Knowledge Workers Get Things Done, and Mastering the Unpredictable and provides important papers by thought-leaders in this field, together with practical examples, detailed ACM case studies and product reviews. Nathaniel G Palmer, WfMC and Business Process Management, Inc. And Lloyd Dugan, Business Process Management, Inc.
Case Management is an approach to both process and information management that exposes structured and unstructured business information (business data and content) and allows collaborative teams to execute work in a secure but transparent manner. It is sometimes incorrectly regarded as a separate management discipline from Business Process Management (BPM). Yet just as often it also struggles to be understood on its own terms as helping to further expand BPM with new concepts. This inherent confusion which still surrounds the “BPM vs Case Management” discussion is exacerbated by the leading analysts groups who have been unwilling to standardize on terms. Forrester, for example, has fairly consistently talked about “Dynamic Case Management” software products, without directly addressing the overlap between their list of these and their list of BPM products. While Gartner has yet acknowledge case management as a distinct category of software and sought to pigeon-hole products as “Case Management Frameworks” or “CMF’s” using phrases such as “...a CMF and the BPMS it runs on” to make the concept of case management intractable from BPM or BPMS. Both competing approaches have elements of truth and inaccuracy. The fact is, Case Management software is a distinct category and is not simply a use case or implementation pattern for traditional BPMS. Yet Case Management is an important part of the broader BPM landscape and fundamental to the redefinition of BPM in recent years. This chapter provides a perspective for understanding and evaluating the most advanced platforms for delivering case management – specifically Adaptive Case Management (ACM) – as a specific category of BPM software, distinct from the more traditional, integration-centric BPM. The material presented here is meant to inform those seeking to acquire or use case management software, and to provide help in finding the correct solution as opposed to selecting from the correct “magic quadrant” or other arbitrary round-up. After seven months of traveling Curiosity lands on Mars. The engineers in NASA mission control are excited to start scientific research. These scientists have a special challenge; the Mars rover is so far away and the signal takes so long, that they need to rely on automation in order to maintain control in the wildest scenarios. There are many decisions that must be made on a daily, and even on a minute-to-minute basis. Involving the scientist in every possible decision, given the round trip time to consult and answer, would slow the research to – literally – a crawl. The scientists who operate the rover are knowledge workers. Just like knowledge workers in a business setting, they must figure out how to accomplish goals, as they uncover new information that affects their goals. The automation that they use built into Curiosity is very much like the business processes that businesses use to achieve their goals: the process works fine as long as the situation matches what was expected. But what happens to a business process when confronted with something unexpected? This chapter takes us on an exploration of how to adapt to the unexpected--including a Little Green Man--using the Mars Curiosity as an entertaining, but highly enlightening example. Modern, civilized societies depend on law and structured relations, providing a substrate for organizations and individuals to collaborate and compete. Both businesses and public sector must behave in compliance with such rules, and at the same time need sufficient flexibility to perform their tasks according to the situations at hand and in a constantly changing world. IT tools supporting businesses and public sector organizations must aid the users with compliance as well as flexibility. Traditional IT systems have laid the burden of compliance on the users, whereas BPM-systems attain compliance at the expense of flexibility. This paper describes a set of means to providing compliance with flexibility, based on real life experiences from widely used and long running ACM systems in the Norwegian Public sector. In the highly regulated Scandinavian societies, the public sector takes on responsibilities that may, in other jurisdictions, be covered by private corporations. The experiences should therefore be equally relevant for the private sector. Most efforts to develop requirements for court case management systems are inadequate to capture the intricacies of production case management. But a methodology relating capabilities (the “what” and “why”) and processes (the “how”) successfully describes what court case workers want. Practitioners may debate the definitions and relationship of capabilities and processes, but this approach to development of case management requirements is purely a practical one, for use in identifying best commercial off-the-shelf candidates and for implementing in highly-configurable systems such as BPM suites. Business needs drive the requirements for a system, so interactively identifying with case managers a hierarchy of capabilities, usually decomposed three levels, generates a large tree structure that describes what case managers do. Developing each detailed capability leads to identifying demonstration scenarios, business rules, reports/ displays, application capabilities, data exchanges, data needs, and technology infrastructure which support each capability. Processes identified at this detailed level contain reusable tasks, overlapping the content of detailed capabilities. With system functions specified with this amount of detail, case workers are able to exercise capabilities in any order as needed – just what they want. The author explores the court world where many organizational aspects of case management are generally agreed-upon, including roles and responsibilities of case managers, the goal of disposing cases as quickly (and fairly) as possible, and the force of statutes and court rules specifying many business rules. Big data and data mining have revolutionized how organizations improve their services and products. Companies such as Amazon.com, Target, and grocery stores use transactional data to serve customers better with specific offerings and even predicting what customers are most likely to buy next. Social networking applications such as Twitter and Facebook collect enormous amounts of data from users tweeting each other and posting Facebook statuses. Social networking data is also mined to create detailed user profiles and track trending news events. Processes also create data that can be mined and use to create models of processes that show how tasks and information flow through the process. Process mining can also map the social networks of the workers involved in the processes. In this chapter, the author explains how adaptive case management (ACM) can benefit from using process mining methods. Process mining is designed to discover, inspect, and enhance routine, repeatable business processes. Increasing the efficiency of routine processes increases the overall effectiveness of ACM processes. Further, process mining can be used to improve ACM processes by discovering hidden routine processes and helping knowledge workers reflect on and improve their case management methods. 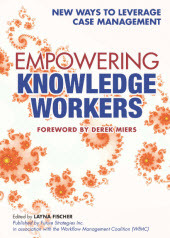 Case Management (CM) and Adaptive CM (ACM) systems are aimed at supporting knowledge workers to run their knowledge intensive processes (Swenson, 2010). An essential part of such support is providing the process participants (i.e. knowledge workers) with the effective means of communication between them in the frame of each process instance/case. The implementation of means for communication/collaboration can differ from one CM/ACM system to another. Some systems may use the traditional message exchange means, others can exploit more modern means; the ones that are already widely employed in social software. To these means belong forums, bulletin boards, and other implementation of the concept of shared spaces. An example of using shared spaces in ACM systems can be found in the chapter “Means to Support Compliance and Flexibility” of this book. To improve the communication means in the existing CM/ACM systems or design them for new systems, there is a need to have a framework that helps with conducting analysis of existing means and designing requirements on the new ones. Such framework should take the variety of possibilities that exist and could appear in the future for arranging communication between the instance/case participants. It should not, for example, assume that all communication is conducted through the messages in a natural language, written, or oral. The paper presents a draft of a framework for analysis of communication capabilities in CM/ACM systems based on so-called Language/Action Perspective (LAP) introduced by Flores and Winograd and their associates in 1980s. This perspective, which is based on the speech act theory (Searle, 1969), has been originally suggested as guidelines for designing communication parts of business information systems (Winograd, 1987). Both classic BPM and classic ACM are about coordination of business activities to achieve particular results. But both of them use different coordination techniques. 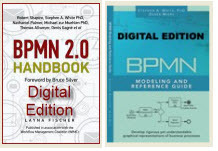 This chapter discusses coordination as a potential base for a common view on BPM and ACM. It is an updated version of my paper on how to understand how separate processes work together as one functional whole (i.e. a System Of Processes -- SOP) at the scale of an enterprise. Use of processes (and constructions related to them ) will reduce the undesired complexity of an enterprise, improve understanding of its structure and behavior which thus facilitates the management and evolution of the enterprise. With 700 offices in more than 70 countries, Crawford & Company provides claims management services used by the largest insurance providers in the world. A core part of Crawford's business is Global Disaster Response for incidents such as hurricanes in the U.S or tsunamis in Japan. Crawford must deploy small armies of claims adjusters to the world's most devastated regions so life – and business – can begin to return to normal in the quickest time possible. These adjusters are not Crawford employees, they are contractors who are un-schooled in Crawford business processes. Using a modern work platform, Crawford built a series of Business Process Management (BPM)-based mobile and social business applications to streamline the management and execution of Case Management across all catastrophe-related resources and claims, from the assignment of insurance adjusters to the management of claims and final claim resolution. Applications include Claim Portal, Global Claim Intake, Claim Assignment & Scheduling (CAT Connection), Contractor Extranet (repairStream), Automated Claim Report Review/Approval, GTS Large Loss Management, Customer Billing, Employee On-Boarding, and more, all via a single platform. The life insurance industry is complex – multitudes of products, different markets, each with their own unique set of processing rules, many policy owners holding multiple policies, spread across broad geographic regions – and each expecting the same customer care they experience when interacting with companies such as Apple, Amazon, etc. As a service provider, supporting call center and back office operations for 36 insurance carriers, this complexity increases exponentially. Call center and operational processes were carrier specific and the outdated/legacy system limitations acted as a bottle neck to consolidate and unify these processes. For every new client/carrier addition, we had to proportionately increase the team size to support the additional volume. Employee satisfaction and motivation levels were low since they had to refer to data from multiple systems to service a call. This was not a sustainable model. We established a customer service optimization strategy (case management and workflow solution) with the main objective of providing the highest level of service possible for each individual customer, while still maintaining the carrier specific processes. Case management and workflow solution developed by leveraging the technical capabilities of BPM software and proprietary insurance industry specific framework of our vendor with our insurance industry expertise in call center and back office operations integrates with any backend systems, thereby providing a unified desktop to our customer service and operational teams. The Contract Generation System, named JuriShare, designed for contracts, was developed on a Sharepoint platform and consists in creating documents based on templates that are part of a workflow solution. This solution automates the analysis processes and establishes a workflow for internal approvals, enabling lawyers to focus on the document's legal aspect. The system is designed for contracts with suppliers and with the Company’s public or private Clients. The Company refers to the first type of documents as “non-strategic” and the second type as “strategic”. For both types of documents, a distinguished workflow was established by the legal department of the Company through which the users may either generate a contract using the system or it may use the system to store the document and to control its status. The system had a significant impact which resulted in cost and time savings, work transparency and quality, as well as monitoring management of documents. Additionally, it enabled control of potential risks, centralized access to documents and decentralized its usability, since some users are remotely established. Overall, the tool stimulates a collaborative and integrated environment among all areas, including the many construction sites which are located throughout Brazil, Headquarters and back office. It also allows all the lawyers spread throughout Brazil and in other Latin American countries to have access to all of the documents included in the system, being an integrative tool which allows the Company to have a better management of all of its contracts. An asylum seeker’s first encounter with Norwegian authorities is through the National Police Immigration Service (NPIS). The NPIS collects information about each immigration case, prior to application handling by the Norwegian immigration authorities. A large percentage of asylum seekers have no passport or valid ID, and many provide inaccurate information, adding to the complexity of identity determination and case investigation tasks. UTSYS is the NPIS’ ACM solution. Used by all operational personnel, UTSYS supports registration, identity analysis, interviews and forcible return, as well as managing Norway’s asylum seeker detention center. UTSYS helps NPIS monitor every pending asylum case, continually updating and completing case information. Case managers are responsible for a portfolio of cases that they own throughout the case lifecycle. Using case context, UTSYS offers the case manager suitable functionality for resolving the case effectively. The Office of Secretary to the Government of the Federation (OSGF) of Nigeria is responsible for effective coordination and monitoring of the implementation of Government policies. The Cabinet Secretariat office of OSGF collates, vets and disseminates memoranda and associated documents from various Council Members, Ministries, Departments and Agencies (MDAs) of the Government. These memoranda and documents form the basis of agenda setting and discussions at the Federal Executive Council (FEC) of the Nigerian government. The FEC comprises of ministers handpicked by the President of Nigeria to spearhead different ministries and businesses of the Nigerian government. The memoranda and documents have dynamic lifecycles undergoing several levels of checks, iterations and annotations. This was largely handled manually, causing problems such as slower processes, manual errors and high operational costs. Maintaining security of information was a challenge too. To overcome these impediments, the Government delegated Galaxy Backbone Limited, its wholly owned ICT subsidiary to create the right solution to this challenge. Galaxy Backbone launched its 1-Gov.net program, which would create a common Information and Communication Technology (ICT) platform for all Ministries, Departments and Agencies of the Federal Government. Prior to implementing its Task Management solution for onboarding new clients to Pershing LLC, a BNY Mellon company, the Client Transition (conversion) team relied on a highly manual, paper-intensive project planning system to track the conversion process and manage multiple tasks. This required frequent in-person meetings, e-mails and phone calls among departments. Administration was difficult and time consuming as project plans had to be printed and shared prior to each meeting and updates were restricted to a single team member from each department. The new automated task management solution allows the conversion team to access and adapt up to 1,100 steps within the master conversion plan for the new client and distribute the plan to more than 150 impacted team members. State of Hawaii, Department of Human Services, U.S. This personal story is written with a holistic perspective in mind: it's not just about case management, it's a case on knowledge management, information management, lean work organisation, performance management, internal communications, team management. Adaptive case management has shown itself as a major supportive methodology - or even better: philosophy for the organisation of our work. I strongly believe that adaptive case management is one of the pieces of the puzzle that forms our 21st century way of working, though, we do not see the whole yet. 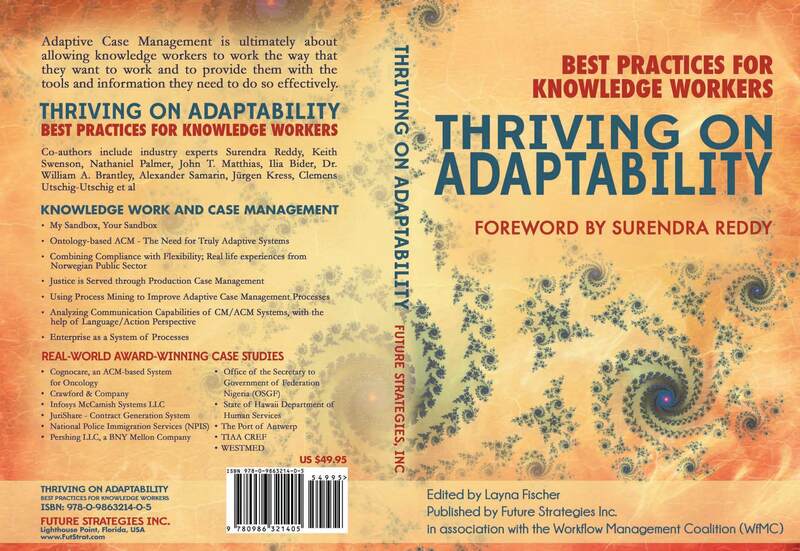 We suspect adaptive case management thinking to be a revolution for today's knowledge company. At least, it made us conscious that in fact any problem-solving act can be perceived as a case, where intuition, trial and error is necessary to bring it to a good end. To see the agile process being developed around the information in a dialectic way, was for us the discovery of the natural, intuitive way that completely fits knowledge work; mirroring how knowledge production works. This chapter, explains that it is not about the introduction of case management in one particular business unit, supporting one specific process. It is about the central Information Management department that takes the initiative to introduce case management thinking with knowledge workers in the whole company, and the externalisation of this will differ from team to team. We promote tools, practices, habits and help teams to fit these into their daily practices. TIAA was the vision of the philanthropist Andrew Carnegie and founded in 1918 (nearly 100 years ago) through his Carnegie Corporation of New York and the Carnegie Foundation with the goal of supporting the financial well-being of college teachers through a pioneering system of annuities and low-cost life insurance. CREF was established in 1952. The organization now employs 9,000 employees in more than 90 local offices with $564 billion assets under the management as of May 2014. TIAA-CREF is currently serving 4.8 million individuals overall. TIAA-CREF has diversified product portfolio offerings, including retirement, IRA, brokerage, insurance, mutual funds, management of 529 college savings plans, trust and banking services, which, by virtue of their complexity, require a great deal of synergy and collaboration within and across the business lines. TIAA-CREF has implemented solutions to their stakeholders across diversified businesses, empowering them to collaborate and achieve a highly efficient and low-cost business model, mitigating operational risks, adhering to regulatory controls and enhancing customer satisfaction and case worker competence. With the case management end-to-end solution, TIAA-CREF case processes can now be consistent across all channels (web, phone and paper), achieving and optimizing a 360-degree case view. The solution enables all correspondence from all channels to be stored within the case folder and available to all necessary parties. The WfMC Awards for Case Management are the ideal way to be recognized by the industry worldwide, to publicly acknowledge and recognize the efforts of your team and to inject passion into your case management projects. These awards are designed to highlight the best examples of technology to support knowledge workers. In 2014 fourteen teams were awarded top honors at the ACM Live Gala Event in June, and are featured in the new book, "Thriving on Adaptability." 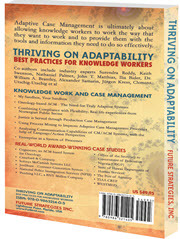 Previous winning submissions were published in "How Knowledge Workers Get Things Done" and "Empowering Knowledge Workers." We work with leading industry analysts Forrester and Gartner who use these case studies to analyze ACM technology suppliers, illustrate trends, industry growth, ROI and more.